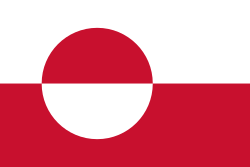 The Flag of Greenland was designed by Greenlander Thue Christiansen. It features two equal horizontal bands of white (top) and red with a large disk at the center. The top half of the disk is red, the bottom half is white. Greenland first thought of the idea of a flag of its own in 1973, when five Greenlanders proposed a green, white and blue flag. The following year, a newspaper printed eleven design proposals (all but one of which was a Nordic Cross), and polled the people to determine the most popular. The Dannebrog was better liked than any. Little came of this effort. In 1978, Denmark granted home rule to Greenland, making it an equal member of the Danish Kingdom. The home rule government asked for flag proposals, receiving 555. 293 were made by Greenlanders. Out of all the designs, the current red-and-white design by Christiansen narrowly won over a green-and-white Nordic cross by a vote of fourteen to eleven. Christiansen's red-and-white flag was officially adopted on June 21, 1985. To honor the tenth anniversary of the Erfalasorput, the Greenland Post Office issued commemorative stamps and a leaflet by its creator. He described the white stripe as representing the glaciers and ice cap; the red stripe, the ocean; the red semicircle, the fjords; and the white semicircle, the icebergs and pack ice. The design is also reminiscent of the setting sun half-submerged below the horizon and reflected on the sea. This page was last changed on 24 February 2018, at 19:47.